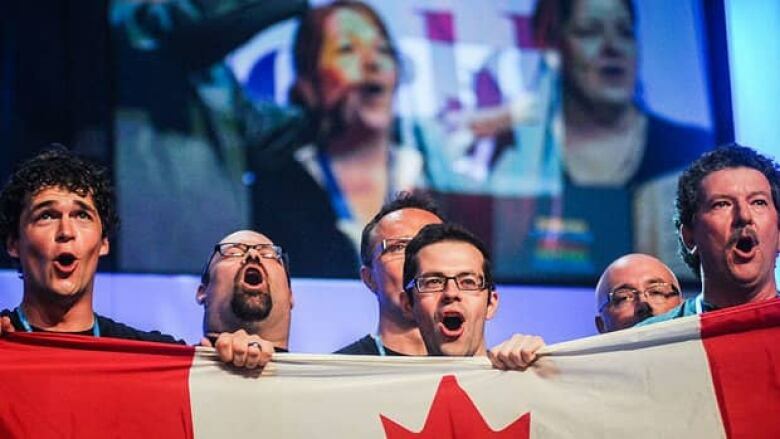 Three Canadian choirs are among the celebrated bands of singers emerging from the 2012 World Choir Games. The singing competition, held every two years, ended its latest edition in Cincinnati on Saturday evening with a gala that included performances by some winners, the Cincinnati Pops Orchestra, Gospel artist Marvin Winans and Broadway star Idina Menzel. 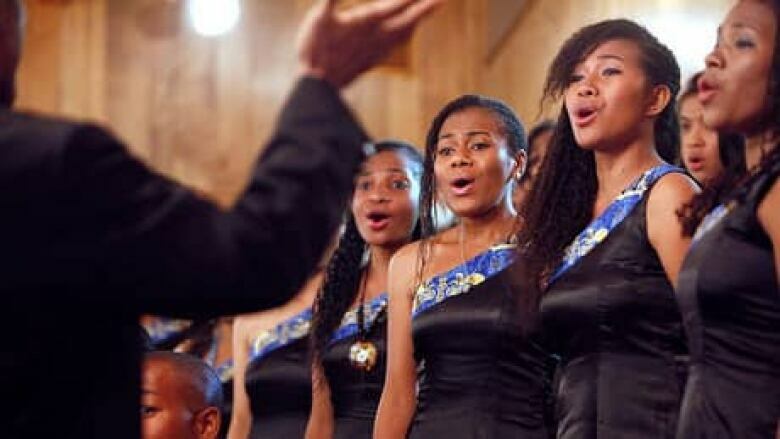 An Indonesian choir, the Gema Chandra Cendrawasih University Choir hailing from Papua, ran into travel snags that delayed its arrival for a week. When they finally arrived Saturday, it was too late to compete. Still, the group — costumed in grass skirts and body paint — chose to entertain the crowd by serenading the audience as it left the closing ceremony. In turn, they were invited to perform at an area church the next morning — receiving standing ovations for each song — before boarding a return flight home on Sunday. Newman Sound Men's Choir of St. John's, winner of the male chamber choirs category in the champions division. Prairie Voices of Winnipeg, recipient of a gold medal in the mixed choirs category in the open competition division. Oakville children's Choir of Oakville, Ont., recipient of gold medals in the musica sacra and youth choirs of equal voices categories in the open competition division. Young children's choirs: Wenzhou Children Art School Boys Choir (China). Children's choirs: Vocalista Angels (Indonesia). Youth choirs of equal voices: Guangdong Experimental Middle School Choir (China). Young male choirs: Diocesan Boys' School Choir (China/Hong Kong). Mixed youth choirs: The "8 Seconds" Mixed Chorus of Hangzhou Normal University (China). Mixed chamber choirs: The Sunday Night Singers (U.S.). Mixed choirs: Stellenbosch University Choir (South Africa). Female chamber choirs: Latvian Voices (Latvia). Female choirs: Shanghai Conservatory of Music Girls Choir (China). Male choirs: Mannerstimmen Basel (Switzerland). Male chamber choir: Newman Sound Men's Choir (Canada). Musica sacra: Stellenbosch University Choir (South Africa). Music of religions: Stellenberg Girls Choir (South Africa). Musica contemporanea: Stellenberg Girls Choir (South Africa). Jazz: Dekoor Close Harmony (Netherlands). Gospel: Jeremy Winston Chorale (U.S.). Spiritual: Aeolians of Oakwood University (U.S.). Barbershop: Greater Harrisburg chapter Sweet Adelines (U.S.). Popular choral music: Dekoor Close Harmony (Netherlands). Folklore: Ninos Cantores de la Orquesta Sinfonica Juvenil y Camerata Larense (Venezuela). Scenic folklore: Kearsney College Choir (South Africa). The 2012 edition of the Games, which were held in North America for the first time, began July 4. The next World Choir Games will take place in Riga, Latvia in 2014.